Foxglove (Digitalis), is an old-fashioned bloomer that brightens up shady areas in a flower bed with hues of white, pink, lavender, red, yellow or rose. Depending on the variety, the spiky blooms can grow a demure two feet up to tall six-footers. Foxglove will thrive in nearly any climate, including those with sub-zero winter temperatures as low as -30 degrees Fahrenheit. However, it won't tolerate extremely warm, humid climates. 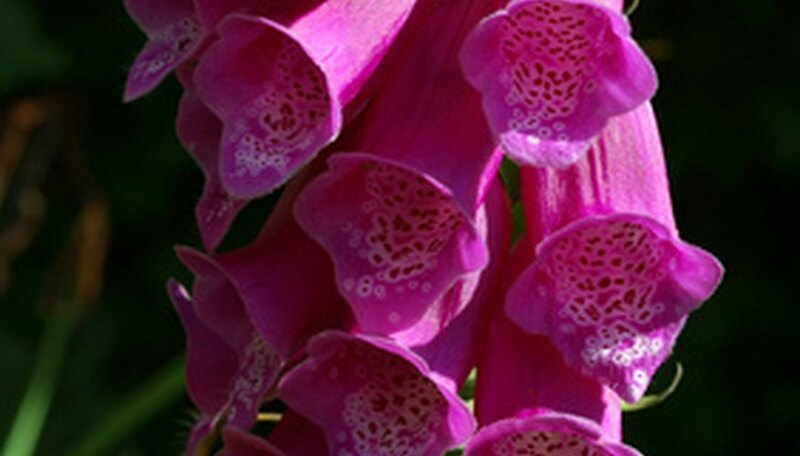 Plant foxglove where the plant will be exposed to morning sunlight and afternoon shade if you live in a mild climate. In hot climates, foxglove should be planted in full shade. Foxglove can be planted by tossing the seed on the soil, with no need to cover the seeds or add fertilizer. You can also start with bedding plants available at a garden center or nursery. Keep the soil damp at all times. Foxglove can tolerate periods of drought, but won't produce a large number of blooms and won't do well in soggy, poorly-drained soil. Stake tall varieties of foxglove. Drive a wooden stake into the ground a few inches from the plant, and attach the plant loosely to the stake with a garden tie or a strip of soft fabric. Pinch wilted foxglove blooms. Pinching the spent blooms, or deadheading, will encourage the foxglove to continue blooming and will keep the plant looking neat. Divide foxglove every three or four years. Dig the plant with a garden fork or a shovel, digging deeply to avoid damaging the roots. Use your hands to divide the plant into smaller sections. Plant and water the divided foxglove immediately. Foxglove can easily be dried for use in dry flower arrangements. Gather eight to 10 spikes and bind the bottoms of the stems together with a rubber band. Hang the foxglove upside down in a dry, well-ventilated area until the blooms are completely dry, usually at least two weeks. Foxglove is a toxic plant. Always wear gloves when handling foxglove, and keep the plant away from pets and children. Although the bitter taste of the plant makes it unpalatable, ingestion can cause severe illness. What Is a Foxglove Plant?